While the weatherman might be predicting a gorgeous 67-degree day next weekend, the temperatures might very well dip down into the 40s at night. Make sure you are prepared for the wide range of temperatures that campers experience in both the fall and spring seasons. We have seen so many campers run out to the store to buy sweatshirts, coats, rain boots, and socks while on fall and spring camping trips. Prepare to layer outfits with jackets and sweaters for the morning and evenings and t-shirts for the warm afternoons. The fluctuating temperatures may bring increased moisture as well. We never camp in the shoulder season without raincoats and waterproof footwear. Your propane may last a long time in the summer, but your camper furnance uses much more gas than any other draw in the RV. Make sure you have full tanks before leaving for a fall or spring camping trip, and use a gauge to check them throughout your stay at the campground. We learned this lesson the hard way years ago, when we ran out of propane in the middle of a chilly, 30-degree night. If you keep your RV heater on, you don’t have to worry about any of your water pipes freezing in colder temperatures. However, the water running from the campsite hookup to your RV may freeze in the hose. Avoid this by investing in a heated hose, which will keep fresh water coming out of your faucets even if an early frost arrives. This can be tricky, but we highly recommend looking for sunny, but sheltered campsites during the fall and spring. Sun exposure will help heat your RV, and it will also help dry up the moisture that from an overnight frost. Having a campsite with trees and bushes around the perimeter will allow you to enjoy a warm campfire and it will protect you from chilly winds at night. We cherish our last few camping trips in the fall, and we look forward to those first RV adventures of the spring. With a few tweaks to our planning, packing, and gear we are able to fully enjoy the cooler temperatures. 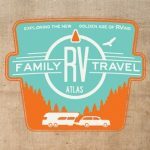 So why not schedule one more RV trip this year…and maybe we’ll see you at the campground!